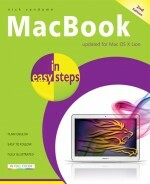 MacBook in easy steps, contains all of the information you need to use MacBooks for both business and pleasure. 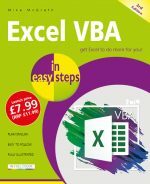 The book looks at the specifications and hardware of MacBooks and details how to get up and running with this attractive, stylish and highly functional laptop. MacBook in easy steps covers the MacBook operating system, OS X Lion in detail helping you to set up and get the most from your MacBook. This book also covers the developments to the OS X Lion operating system that has been designed for the fast moving times in which we live. Computer apps are increasingly a part of everyday life and OS X Lion has a Mac App Store for storing and using all of your favorite apps. There is also a handy Launchpad function, where you can manage all of your applications, whether it is the ones on your MacBook, or new ones you have downloaded. Using a MacBook touchpad, OS X Lion also delivers the same Multi-Touch functionality as the iPad in terms of scrolling and zooming. Other new features include a Resume function so you can get back to work quicker, Auto Save, Versions comparison and Air Drop, which enables you to send files to anyone within wireless range. MacBook in easy steps is a handy guide for anyone who wants to get more out of their MacBook without spending too much time and effort! Learn MacBook basics for free!